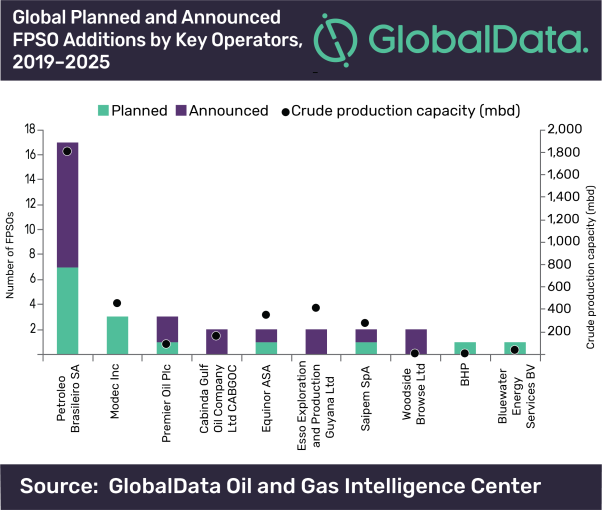 Petroleo Brasileiro SA (Petrobras) is expected to deploy 17 planned and announced floating production, storage and offloading vessels (FPSOs) globally during the outlook period 2019–2025, the highest among all the operators globally, according to GlobalData, a leading data and analytics company. The company’s report: ‘Q2 2019 Global FPSO Industry Outlook – Petrobras Continues to Lead Global FPSO Deployments’ reveals that globally, 67 planned and announced FPSOs are expected to start operations between 2019 and 2025. Of these, 23 are planned FPSOs and 44 are announced FPSOs. Among 17 planned and announced FPSO’s to be operated by Petrobras by 2025, 15 are expected to be deployed in Brazil by 2025. The country deployment details of two FPSOs – Es Agua Profundas and Sergipe Agua Profundas II – are presently unknown. Of the 17 Petrobras-operated FPSOs, 10 are announced FPSOs and seven are planned FPSOs. After Petrobras, Modec Inc, and Premier Oil Plc are jointly in second for deployment of planned and announced FPSOs, with three FPSO’s each by 2025. Among regions globally, South America continues to lead with 27 planned and announced FPSO additions by 2025. Brazil and Falkland Islands are the key countries in the region for FPSO deployments. Among operators, Petrobras leads South America in terms of FPSO deployments. GlobalData identifies Africa as the second highest region with 15 upcoming FPSO additions by 2025. Angola and Nigeria are the key countries in the region for FPSO additions, respectively, during the period 2019–2025. Saipem SpA and Cabinda Gulf Oil Company Ltd are the key operators in the region. Europe is the third highest among the regions in terms of planned and announced FPSO additions. The region has a total of eight upcoming FPSOs during the outlook period. The UK and Norway are the key countries within the region for FPSO deployments.